(Phys.org) —A team of researchers with members from facilities in the Czech Republic and one from the U.S. has discovered the mechanism by which unique sandstone landforms take shape. 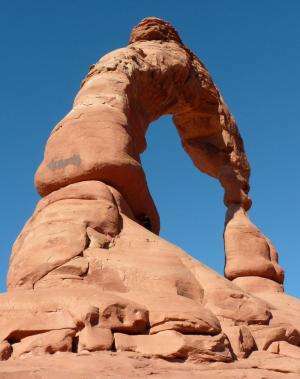 In their paper published in Nature Geoscience, the team describes how their studies of sandstone in their lab led to insights about how both gravity and erosion contribute to the creation of such unique structures as Delicate Arch at Arches National Park in Utah. Chris Paola of the University of Minnesota offers a News & Views piece on the research done by the team in the same journal issue. Curious as to the real mechanism by which sandstone landforms take shape, the researchers took several samples into their lab and subjected them to intense scrutiny—after cutting the samples into cubes, they used pressure plates to simulate the loads of real structures while also subjecting them to simulated wind and rain. As the cubes were deformed, close inspection revealed that in the parts of the sandstone subjected to direct pressure (simulated gravity) individual grains tended to lock together creating sections of stone that were more resilient to wind and rain. That led to the creation of pillars within the sandstone that stood strong as the grains around them were swept away. As more free grains were swept away, more pressure was exerted on the column causing the grains in them to lock even tighter. 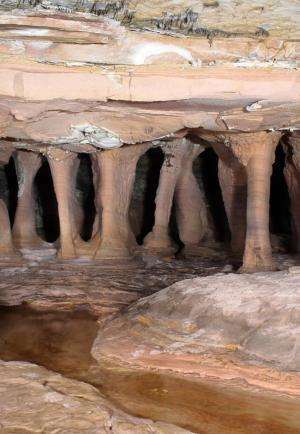 The team found that when pressure was applied from above to different parts of a cube, and artificial cracks and other perturbations were also introduced to the sandstone, it led to the development of interesting and unique shapes when subjected to simulated erosion. The researchers believe this same action applies to sandstone in its natural state, and accounts for the remarkable shapes that have left those beholding them wondering how they could have formed and then withstood the ravages of wind and rain—it's because their columns have been made strong enough to withstand further weathering. Weathering and erosion of sandstone produces unique landforms1, 2 such as arches, alcoves, pedestal rocks and pillars. Gravity-induced stresses have been assumed to not play a role in landform preservation3 and to instead increase weathering rates4, 5. Here we show that increased stress within a landform as a result of vertical loading reduces weathering and erosion rates, using laboratory experiments and numerical modelling. We find that when a cube of locked sand exposed to weathering and erosion processes is experimentally subjected to a sufficiently low vertical stress, the vertical sides of the cube progressively disintegrate into individual grains. As the cross-sectional area under the loading decreases, the vertical stress increases until a critical value is reached. At this threshold, fabric interlocking of sand grains causes the granular sediment to behave like a strong, rock-like material, and the remaining load-bearing pillar or pedestal landform is resistant to further erosion. Our experiments are able to reproduce other natural shapes including arches, alcoves and multiple pillars when planar discontinuities, such as bedding planes or fractures, are present. Numerical modelling demonstrates that the stress field is modified by discontinuities to make a variety of shapes stable under fabric interlocking, owing to the negative feedback between stress and erosion. We conclude that the stress field is the primary control of the shape evolution of sandstone landforms. 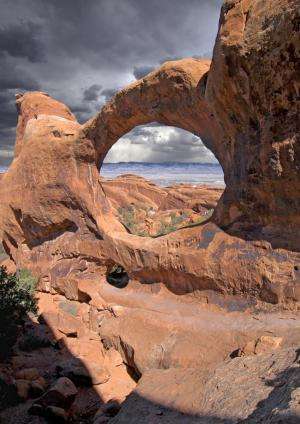 Interesting research especially since I have been to the double arch shown in the picture.